Hemangiosarcoma is a cancer that develops from the blood vessels of the body. We typically see these tumors develop in the spleen, liver, skin or heart of dogs; although, they can occur anywhere in the body. Symptoms vary depending on what organ is affected. Because the vessels in hemangiosarcoma tumors do not have normal connections, they are more likely to tear and bleed. This is why the first sign of this type of cancer can develop when a mass in the liver or spleen is bleeding. A bleeding episode can cause weakness, lethargy, pale gums, decreased appetite and a painful abdomen. When these signs occur, it is important that a pet be examined by a veterinarian. If a tumor is bleeding very quickly, surgery may be necessary to try to remove the mass and stop the bleeding. If the tumor is bleeding slowly, clinical signs may be waxing and waning in nature. The patient will feel poorly one day but energetic a few days later. Still, other dogs do not have any symptoms from hemangiosarcoma, yet a mass is found incidentally with ultrasound examination. Hemangiosarcoma is a diagnosis reached when a pathologist evaluates a tumor usually after the whole mass has been removed. Some masses in the liver or spleen can look like hemangiosarcoma with ultrasound but may actually be a different type of tumor or even just a hematoma (blood clot) that can be differentiated by a pathologist. When a hematoma or benign tumor, such as a hemangioma, is diagnosed, surgery to remove the mass can be curative. Therefore, prognosis cannot be determined based solely on the appearance of a mass. Ultrasound examination of the abdomen or the heart is the most common way that hemangiosarcoma is identified. Before surgery to remove a mass in the liver or spleen is pursued, blood work to evaluate body organ function as well as clinical staging involving X-rays of the chest is recommended to determine if there is evidence of metastasis (spread of the cancer). 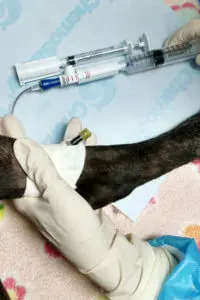 The treatment for hemangiosarcoma typically involves surgery followed by injectable chemotherapy. Many people are nervous about the side effects that may occur with chemotherapy; however, protocols have been developed to be effective while minimizing side effects to your pet. The doses of medication used are much lower than those used in people; therefore, dogs tolerate chemotherapy much better than people do. This allows the oncologist to reach their goal of maintaining an excellent quality of life for each patient throughout their treatment. Measuring from the time of diagnosis, most animals have a survival time of 6-9 months after the diagnosis of splenic hemangiosarcoma when they are treated with surgery to remove the spleen followed by chemotherapy. For families that choose not to pursue chemotherapy, oncologists will work with you and your primary care veterinarian to maintain a good quality of life for patients with hemangiosarcoma for as long as possible. The cost of treatment is based on the type of chemotherapy drug and how it is administered. During your evaluation, the oncologist will have an extensive discussion with you about your pet and what protocol will be most appropriate. You will then be provided with the estimated costs involved with diagnosis and treatment.